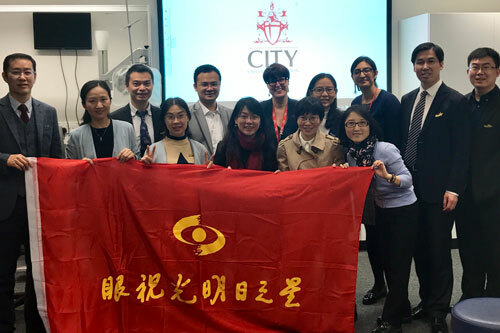 Delegates from the prestigious Chinese Rising Star optometry programme came to City, University of London in September to learn more about the excellent teaching, research and state-of-the-art facilities at the University. Touring the Division of Optometry and Visual Science in the School of Health Sciences as part of a 2-day visit to the Association of British Dispensing Opticians (ABDO) offices in London, the group of 14 Chinese ophthalmic educators and researchers received talks from various academics, as well as a visit to the City Sight eye clinic. The delegates were met by Divisional Lead Dr Ahalya Subramanian and Programme Directors Drs Byki Huntjens and Catherine Suttle, who also explained the optometry programmes at City. After a tour of the state-of-the-art eye clinic City Sight, the group were met by members of staff to present their research interests and provide a tour of the research labs. The delegates were very impressed with the facilities, and captivated with the research projects presented by Dr Michael Powner (biology), Dr Pete Jones and Deanna Taylor (Crabb Lab), and Dr Manbir Nagra (myopia control). Dr Byki Huntjens also discussed the possibility for City to be part of student exchanges between London and China, as part of an initiative between Wenzhou Medical University, NEWENCO in Boston and SUNY in New York City, USA. The Chinese Rising Star group was led by Professor Chen, the Vice Director of the Eye Hospital of Wenzhou Medical University. Professor Chen was previously recognised as the National Young Leading Scientist by the Ministry of Science and Technology, and National Excellent Talent of the New Century by the Ministry of Education. He currently holds a post as Professor of Ophthalmology and acting Director of China National Engineering Research Centre for Vision Care.